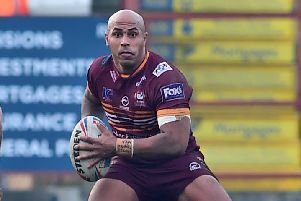 Batley Bulldogs and Dewsbury Rams have named their 19-man squads for the Good Friday Heavy Woollen derby at Fox’s Biscuits Stadium, kick off 7.30pm. The sides go into the game level on six points in the Kingstone Press Championship table, with Batley just ahead on points difference. Batley Bulldogs: Wayne Reittie, Shaun Ainscough, Cain Southernwood, Keegan Hirst, Anthony Nicholson, Alex Rowe, Alex Bretherton, Sam Scott, Luke Blake, Alistair Leak, Adam Gledhill, Joe Chandler, Tom Lillycrop, Lee Mitchell, Shaun Squires, James Brown, Jordan Grayston, Brad Day, Matty Fozard. Dewsbury Rams: Toby Adamson, Makali Aizue, Aaron Brown, Jason Crookes, Joel Farrell, Wayne Godwin, Shane Grady, Dalton Grant, Scott Hale, Tom Hemigway, Ryan Hepworth, Kieran Hyde, Paul Jackson, Dale Morton, Rob Spicer, Byron Smith, Anthony Thackeray, Matty Wildie, Karl Pryce.